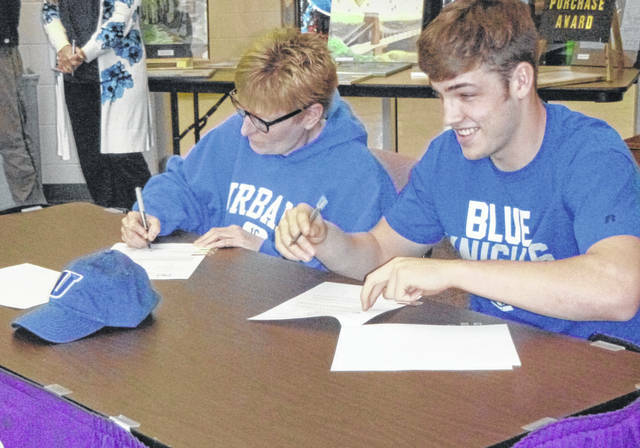 Mason Mollohan and his mother, Danielle Mollohan, sign documents for Mason to attend Urbana University and play football. MOUNT GILEAD — Mason Mollohan will join older brother Michael on the Urbana University football team this fall. Mollohan signed his letter of intent at a ceremony at Mount Gilead High School Wednesday afternoon. Urbana is a Division II school in Champaign County. His mother, coaches and teammates attended. The Blue Knights were 5-6 last season and play in the Mountain East Conference, comprised mainly of West Virginia schools along with the College of Notre Dame in Ohio and the University of Virginia-Wise. “I’ve been to every home game. I just missed playing with my brother since my freshman year. I thought it would be good to play another year with him,” Mollohan said. Michael is the starting right guard and will be a senior this fall. The 6-5, 225-pound Mollohan was a first-team All-Ohio pick in Division V, after making 50 catches for 850 yards and 10 touchdowns as a junior. He will play tight end at Urbana and plans to study criminal justice. As a senior, the two-way performer recorded 6 sacks from his defensive end position. He also hauled in 6 TD passes and had about 500 yards receiving. Mollohan leads the Indians on the hardwood, averaging 17 points and 9 rebounds per game, both tops in the KMAC. He also has 16 blocked shots through 15 games. He reached the 1,000-point milestone earlier this season. Mollohan thanked his teammates and the Mount Gilead coaching staff for helping him along.